It is no accident that the film which enabled Manfredi to attain an enduring popularity, after a decade or so of a respectiable career, was L'IMPIEGATO (THE OFFICE CLERK: 1959) by Gianni Puccini, written by him and Puccini together with future director Elio Petri and the critic Tommaso Chiaretti. It's a film that lies outside the traditional models and vaguely resembles THE SECRET LIFE OF WALTER MITTY by Norman Z. McLeod, which made a star of Danny Kaye. Here too Nando is a modest and shy office clerk who escapes into dreams, where he imagines all sorts of romantic adventures with a ravishing pin-up. By day, instead, he is persecuted by a terrible woman inspector who has been sent from the main office to teach the company personnel new marketing techniques, which the poor man is incapable of learning. A familiarity with the Italian white-collar milieu is mingled with a recollection of Thurber's short stories in a successful blend of subtle and intelligent humor. A CAVALLO DELLA TIGRE (RIDING THE TIGER) is the result of Manfredi's encounter with the director Luigi Comencini, an encounter that turned out to be highly fruitful. Written by Age, Scarpelli, Comencini and Monicelli, it tells the bitter-sweet story of a poor dupe, in jail for simulation of a crime, who escapes but once outside, like Toto in Rossellini's DOV'E LA LIBERTA? (WHERE'S FREEDOM), runs into disappointments of all kinds, deciding in the end to let himself be caught and taken back to jail. 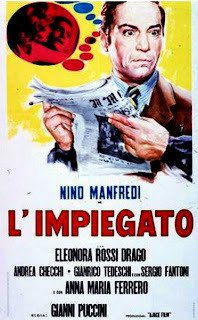 The story does not lack in light comedy and amusing gags, but it's to Manfredi's credit that he succeeded in hitting upon a tone of controlled restraint, with no farcical exaggerations, no over-coloring of the situations.